What defines Oregon’s high desert? Bounded by the Cascade Mountains to the west and the Blue Mountains to the north, Oregon’s high desert covers approximately 24,000 square miles. Annual rainfall in the high desert varies from 5 to 14 inches. The average elevation is 4,000 feet; at 9,733 feet, the summit of Steens Mountain is the highest point in Oregon’s high desert. The terrain of the high desert was mostly formed by a series of lava flows that occurred between 30 and 10 million years ago. 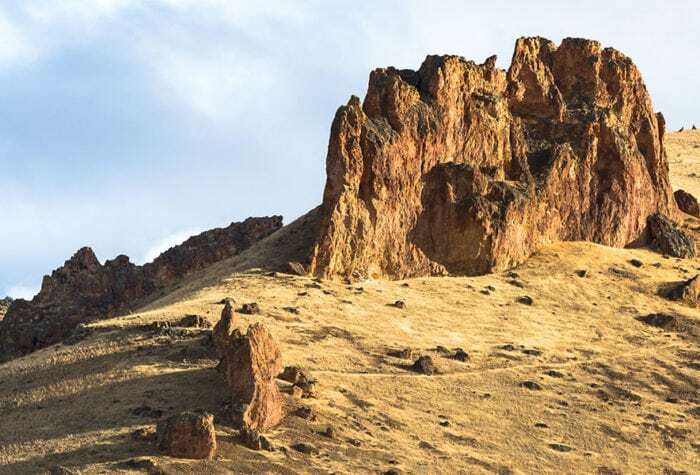 35 percent of the Owyhee River and whole North Fork are designated as Wild and Scenic for their recreational, wildlife, geologic and cultural values. Cutting through benches of the Owyhee Canyonlands that were formed by volcanic activity and erosion, the river is an oasis for all visitors in the remote and harsh environment of southeastern Oregon, and has been since prehistoric times. Archaeologists have recorded 100 prehistoric campsites on the lower segment of the Owyhee River, and today a variety of raptors, mammals, and song and game birds find solitude here. Come experience early season kayaking and rafting, discover golden eagles, sage-grouse and pronghorn, and help protect the Owyhee River. The Donner und Blitzen River has a rich history. This river was first used by the Northern Paiute and their predecessors, and later by pioneers. It is home to the Riddle Brothers Ranch National Historic District, which was owned by three bachelor brothers who migrated from western Oregon and gained control of the water in the area in order to build their ranch. Translated from German as “thunder and lightning,” the river was named by German soldiers who experienced a thunderstorm while crossing the river. It was eventually bought by the BLM in 1986. Large tracts of the river and its tributaries course through marshlands, bogs and seeps. Riparian zones here are dominated by willows, western birch and quaking aspen. You may find American kestrels, great horned owls or Rocky Mountain elk. The river also hosts two sensitive fish species – a wild, native redband trout population and the Malheur mottled sculpin – and is recognized as one of Oregon’s finest wild trout streams. Wildhorse Creek descends from Wildhorse Lake, a high elevation lake supporting a unique ecosystem in an Area of Critical Environmental Concern. Kiger Creek begins near Kiger Outlook and winds through the Kiger Gorge, a glaciated canyon. There is even a section that runs through the prominent canyons of the Steens Mountain Wilderness. It is home to a unique geologic feature known as “the Kiger notch” where, on a clear day, you can see vistas extending to the horizon. Elk and mule deer live here, and well-prepared visitors frequently come to hike and camp in the pristine and remote area. Despite its existence in a dry semi-arid environment, water from springs creates a unique riparian zone in sections of steep basalt canyons along the Wild and Scenic Crooked River. The Crooked River supports nesting and hunting habitat for bald eagles, golden eagles, ospreys and other raptors that are frequently spotted here, as well as the steelhead, brown trout and native rainbow trout that make the area renowned for sport fishery. Chimney Rock is popular for camping, hiking, biking and wildlife viewing. The North Fork of the Crooked River is interspersed with old-growth ponderosa pine forests and streamside meadows that are occasionally home to Estes’ wormwood or artemsia. Experience the river’s rugged natural character, discover numerous caves while you’re there, and help protect the unique riparian habitats along the Crooked River. Find your way along the Malheur River rich in scenery, geology, wildlife habitat and history. The river winds through a steep glaciated canyon ranging from 250’ to 1,000’ in depth. Early logging history is evidenced by an old splash dam and logging camps. Splash dams operated in western Oregon from 1880-1950 to transport timber downstream before logging roads existed. These dams spanned the width of a river and created an upstream reservoir where water and logs were stored until the spillway was opened to release a large flood, carrying the logs to the mill. Today the river is renowned for its beauty and recreational offerings. Scenic and remote, it is popular for fishing, biking, camping and hiking. As the longest undammed river in Oregon, the John Day River has a lot to boast about. Evidence of human activity along the river dates as far back as8,000 years ago, with more than 100 prehistoric sites including pithouse villages, rock shelters, pictograph sites, petroglyphs, and rock feature and tool manufacturing sites. The river also played a role in more recent history. Pioneers migrated across it as they followed the Oregon Trail and early gold miners frequented it for gold-panning. This year, as we mark the 50th Anniversary of this win for wild rivers, we can celebrate protected rivers by appreciating the adventures and habitat they offer. If you get a chance to visit any of the Wild and Scenic rivers in the sagebrush steppe, or any of any of the 58 Wild and Scenic rivers in Oregon, be sure to take photos and share them with the hashtags #makeyoursplash #wildandscenic and #OregonHighDesert to help others experience their beauty. You can also honor the tradition of river protection by engaging in efforts to protect places like Whychus-Deschutes and standing up for the basic environmental safeguards provided through the National Environmental Policy Act, another important law enacted in the late 1960s. From the front page to the outback, a look at issues that affect Oregon’s high desert.